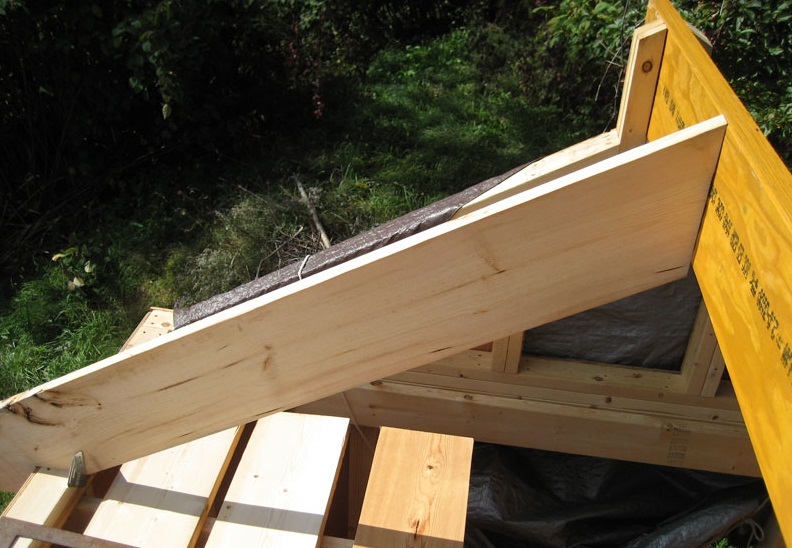 Using a structural ridge beam for your log cabin roofing is much stronger and more stable than a conventional ridge board held in place with rafters. It is also easier to assemble by installing the ridge beam and then hanging the rafters from the beam and can span long distances. The roof loads are carried by the LVL (laminated veneer lumber) and transferred down the load path via end supports and posts. 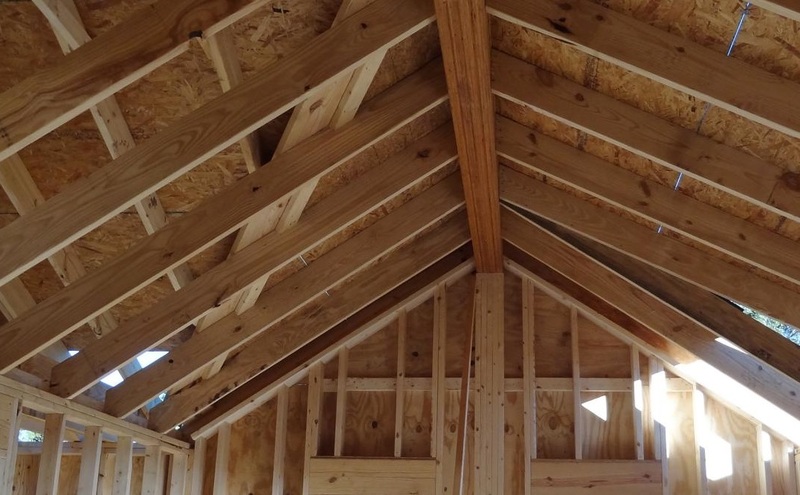 Conventional construction of a gable roof or A-frame roof uses a ridge board and this is primarily for ease of construction; it gives you something to nail the ends of the rafters to while assembling your roof. A structural ridge beam, instead, is used when the high ends of the rafters require independent support. This is required for roof slopes less than 3 on 12 by the International Residential Code (IRC) and International Building Code (IBC) and also on a cathedral ceiling such as often used in log cabins. A structural ridge can be used when installing structural insulated panels, or SIPs on a cabin roof. If there is no attic floor or ceiling joists, there is no way to provide resistance to outward thrust force from low ends of rafters. The bottom ends of the rafters will push out and the roof will collapse. Using a structural ridge supported on both ends means that the rafters are supported independently of each other by the ridge beam itself. Once you have the structural ridge beam set up, it's time to install rafters. This can be tricky since each rafter will push on the ridge beam with its own weight, and this can push the beam out of line. Try to balance the installation by matching rafters on both sides as you work along, rather than installing all of the rafters on one side first. It's also a good idea to install several matching pairs spaced out along the ridge beam span in order to keep it straight, then go back and fill in the remaining rafters. There are a couple of ways to hang the rafters from the ridge beam: from the top and from the bottom, using two different types of rafter hangers. If I'm using top rafter hangers I'll install them 24" o.c. before doing anything else. Then I can work my way along dropping the rafters into place and nailing them through the hanger. 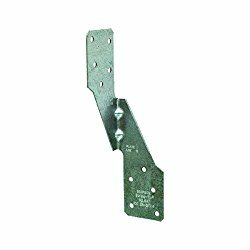 One issue can be that your ridge beam may not be thick enough for two hangers meeting on top. Using bottom rafter hangers, I'll generally hold the rafter in position and nail it through the top edge to hold it, then install the hanger by pushing it up flush on the bottom and nailing. Of course, there are special nails for these types of hangers: 1 1/2" long 9-gauge galvanized nails that won't split out the opposite side. A requirement for proper ridge beam design that must be taken into account is resistance to wind uplift force from rafters. You must provide adequate tie-down connections between the ridge beam and its supports. Steel strap ties are often specified, but wood side-pieces extending up alongside the ridge beam from the ridge supports or columns also can be used. Don’t forget to secure the base of the support columns also to resist uplift forces. Some roofs will also require collar ties between opposing rafters, and hurricane ties between rafters and wall plates. Our example below is calculated using the Georgia-Pacific "Engineered Lumber Residential Floor & Roof Systems Product Guide." See below for a free download of this booklet. The structural ridge is made up using an LVL, or laminated veneer lumber. It is an engineered beam made up of multiple plys of wood, much like plywood except that all the strands are oriented in the same direction. This makes the LVL extremely strong in one direction but not in the other. Using an LVL for a structural ridge beam requires that the LVL be installed on edge with the flat side running vertically. 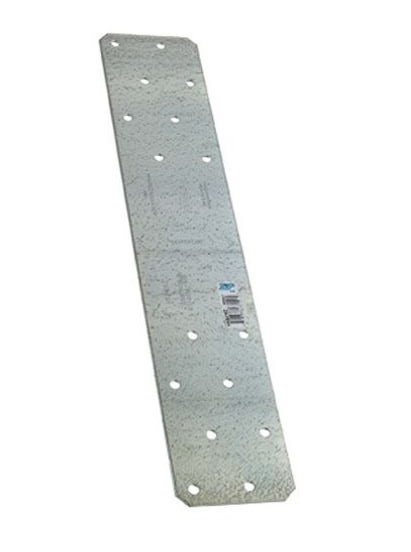 This provides enormous strength vertically, but means that the ridge beam is quite flexible side to side until the rafters are installed and stiffen it laterally. This flexible feature of the LVL along one orientation can actually make it easier to install, allowing us to pass the LVL up by hand, resting it on top of the log walls or scaffolding and bending to rest on the next support. Once in place we can rotate the LVL until it is on edge and becomes very rigid. For our example we will assume a dead weight (the weight of the lumber and materials) of 10 psf (pounds per square foot), and assume a live weight (snow load on roof) of 20 psf, making a total load of 30 psf. Our example log cabin is 26’ deep and 36’ long and we will be installing a supporting post halfway along the length of the cabin. We need to calculate the total load per lineal foot (plf or pounds per linear foot) that the ridge beam needs to support in order to specify the correct size of the LVL. Look under the left-hand column labeled “Span” and go down to 18’. Move across to the right where it’s labeled “Allowable Uniform Loads (In Pounds Per Lineal Foot)”. The Total Load must be 390 or over. We see that the largest single 1 ¾” x 14” will only carry 386 plf and this isn’t enough, so we must continue across the row until we read that a 3 ½” x 11 ¼” LVL beam will carry 407 plf. This can be accomplished by doubling up two 1 ¾” x 11 ¼” LVL’s. This means that we can order a total of four 1 ¾” x 11 ¼” LVL beams to make up our structural ridge beam for the 36’ long cabin. It will be made up of two pairs of LVLs with the center joint located over a minimum of a 4” x 4” because the bearing requirement calls for a minimum of 1.9” bearing surface. In order to use the “Non-Snow” chart on the following pages, the roof angle would have to be greater than 54 degrees to ensure that no snow would build up on the roof. 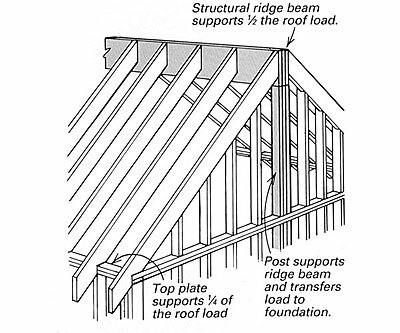 Also, if the width of the ridge beam (11 ¼”) is not high enough to accommodate the entire angled cut on the upper rafter ends, you should fill in the bottom where the heel of the rafter rests with a 2” x 4” so the rafter can’t twist. Using an LVL to make up a structural ridge beam is a stronger method than building a roof using a conventional ridge board supported by rafters and allows you to control the load path along the LVL and down its supporting members.